Friday July 13th 1923 I did some sewing in AM. Rode to town with Cora after dinner. Did errands, came home in taxi. Laura and I to Open Air Theater to see "She is only 38." Very good. weather very warm. Saturday July 14th 1923 I did extra house-work in AM. Then some sewing. Laura went to Aunt Emmas in PM. I had a letter from Lizzie Lindley. We spent evening at home. Sunday July 15th 1923 There was a nice shower this AM. Mollie and Floyd came to take Laura and me to their home. We had a fine day. Frank brought us home at 6 oclock. Mrs Sheldrick went away in the afternoon. 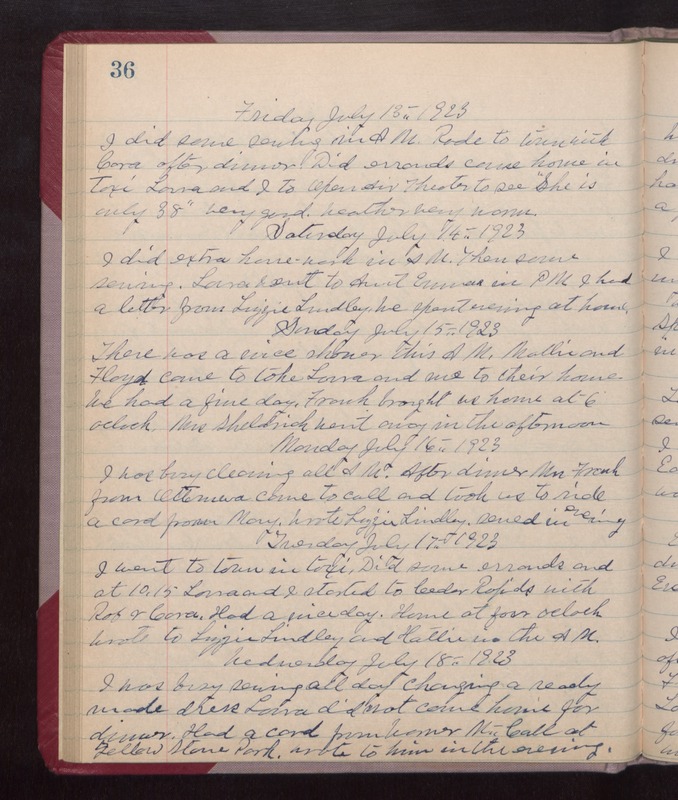 Monday July 16th 1923 I was busy cleaning all AM. After dinner Mrs Frank from Ottumwa came to call and took us to ride. A card from Mary. Wrote Lizzie Lindley. Sewed in evening. Tuesday July 17th 1923 I went to town in taxi. Did some errands and at 10.15 Laura and I started to Cedar Rapids with Rob & Cora. Had a nice day. Home at four oclock. wrote to Lizzie Lindley and Hattie in the AM. Wednesday July 18th 1923 I was busy sewing all day changing a ready made dress. Laura did not come back home for dinner. Had a card from Warner McCall at Yellowstone Park. Wrote to him in the evening.